Here's a twist on an old favorite! I found these at Michael's, a local craft store. They're mini cupcake liners by Martha Stewart. These will give you tiny, bite sized brownies! The snowflake ones are my favorite! I like to make my brownies from scratch, with real melted chocolate! It's simply the best. Click here for the recipe. You can also use boxed brownie. Whatever you prefer will work! Bake at the temperature indicated on your brownie recipe, but keep your eye on it! It will bake in 15-20 minutes. Once the brownies are cool and ready to go, melt some white chocolate and use a fork to drizzle it over the brownies. The trick is to dip your fork into the white chocolate and tap it a couple of times on the side of the bowl, to get rid of the excess. Then, hold your fork over the brownies and rapidly swing the fork from side to side. Crush up some peppermint candy canes. For step by step instructions on how to do this, click here. Sprinkle with the crushed candy canes! Let the brownies sit for 20-30 minutes, until the chocolate hardens. Serve on a pretty platter! Adorable - the kids are going to love them! (so will the grown-ups ;) ). Ok, you win one for creativity! 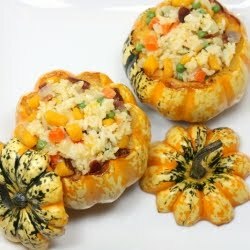 These look spectacular, and I bet taste just the same! I love mini's! Use them all the time as opposed to reg. size cups. It's easier for people to eat more than one! What a fantastic idea Judy - nicely done! Yum! Those look absolutely delicious. The little hint of peppermint from the crushed candycanes would be a beautiful contrast to the brownie, mmm! Love the wrappers and the brownies. Great idea, Judy!